Its been a long while, a long break away from blogging. There is no excuse. I was just plain lazy. But I thought I want to share/write down my reflections from these few days. After close to 5 years of trying and waiting, at an unexpected time (but in God's perfect timing), He blessed us with a child. For the past 30 weeks, He has been weaving and knitting a little human inside my womb. I like how a friend puts it - "This is the only time that God and I can "create" together". But really, it is God who is doing the creating work and I can only try to take good care of my body during this "creation" process. I probably used to take it for granted but now realised that it is a beautiful privilege to be able to conceive and bear a child. And when I say this, I don't mean that any woman who cannot bear a child for whatever reason is any less than those who can. What I mean is that the conception of a child is not an easy thing. It requires many different biochemical and hormonal reactions in the body in order for a pregnancy to take place. And of course, these are only under the control of our Maker, the Creator of this world, our Lord God. Similarly, for a child to continue his/her life (and for everyone, for that matter), only God is in ultimate control. Medicine can only do/help that much. I do not know how long this child growing in me will be alive for. I only know that every day, every hour, every minute that this child is growing and alive, is purely God' grace. Perhaps I sound a little pessimistic here. In the past 2-3 years and especially this year, I have had a total of 5 friends (whom I know personally but may not be actively in contact with), lost their baby either stillborn or breathed no more than a few days after birth. 2 of such occurred within the same month in July. This does not include those whom I know about but don't know them personally. Any death is devastating. Somehow a child/infant's death seems much more heartbreaking. This is why I have not been very excited, unlike our families and friends, but just being realistic that our lives are in His hands and whilst we rejoice and give thanks, we also know that "The Lord can give, the Lord can take away". No matter what happens, His plans for us are good. I have to admit that at the very early stages of my pregnancy, I had moments of fear/worries about miscarrying. Partly because of that, the first 3 months felt like a much longer time to pass. I knew that because it has taken this long for us to conceive, by the time if we do, the child would be very precious to us. I do fear and pray that the child won't be an idol that takes us away from God. I recall 1.5 weeks after my first gynae appointment, telling my close girlfriends that it felt like a long time to have to wait another 2.5 weeks to see the doctor, to know if the child is alive or not. Those months were really a good challenging time of trusting God, trusting that this little life is in His hands. Minutes before I enter the doctor's room at my first few monthly appointments, I would prepare myself that I may not see/hear a heartbeat and pray and remind myself if this child has a heartbeat, it is totally His grace and mercy. I was thankful that the one day where I really worried a lot (and considering if we should carry on our plans to fly to Adelaide when I was 7 weeks gestation), God reminded me gently that rationally, it was safe to fly (my health was ok and doctor says I can fly). If anything happens to baby because of the trip, it is all in His good plans as well. And so I realised that even if the child were to only be alive for a short period of time, I can still thankful for his/her existence, which has shown me that I could conceive and He did answer my prayer. Even though it was very early then, we had shared with our families and very close friends. I was very moved at how all of them were so happy and so full of thanksgiving to God for this conception, this answered prayer, that I know this child is already so well loved and welcomed. Without the conception of this child, I wouldn't have got to experience this, nor people have the chance to specifically praise and thank God for this child, this answered prayer. The realisation of this, got me through the first trimester. The second trimester started to be challenging for me, health-wise. I am one of the lucky ones who didn't have morning sickness in the first trimester (except for an isolated incident at week 14 where I threw up and not due to nausea). I was more tired than usual but I know of others who were much more tired than me. However, it was when I started to have symptoms of water retention which caused my right arm, later my right hand and progressed to my left arm and hands to be numb and weaker due to carpal tunnel syndrome caused by pregnancy-induced water retention. This caused me inconvenience in doing some household chores, cook and prep food and when I sleep. This has and is still training my patience and trusting that even with physical restrictions, I can still give thanks, despite my occasional frustrations of this unexpected and unwanted inconveniences. The symptoms only got worse as time past, with my feet quickly and easily swell up whenever the weather is warm or whenever I ate too salty, or when I walked too much. Overall, I'm thankful that these symptoms and the blood tests I have had did not show any complications to date (I had a scare for gestational diabetes recently but very thankfully, it turned out to be negative). 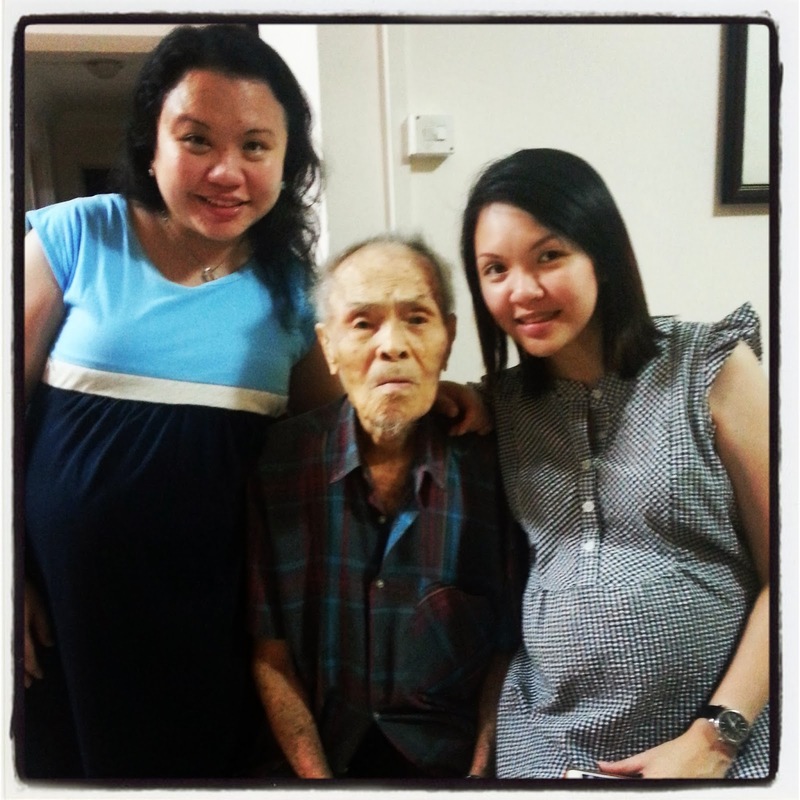 With my sister (who is 2 weeks ahead of me) and my grandfather who will soon be a centurion by the time we both give birth to our baby boys. He is looking very much forward to meeting his 2 great-grandsons. I am 2 weeks into my third trimester now. I know that these 3 months (or less) will feel like the quickest and it is time to count down. Bub can pop anytime from the week of Christmas (8 weeks from now). Thankfully, bub's head is already 'down' about 5 weeks ago. Since sometime in the second trimester, I already have been feeling more and more easily breathless (I get breathless even walking up the stairs at home slowly), having heartburn and getting hungry very easily. My hands and feet are still the same as before. I now sleep with 6 pillows in order to be comfortable. I know that I am already starting to wish that bub can be born soon so that the symptoms can be gone. In addition, I am also finding it awkward to do certain things like squatting down to pick up something , standing by the sink to wash dishes (my tummy is in the way and I have to stand in an unnatural position that my back is being strained and results in backache). Recently I'm also getting tired of having to look for food frequently because I feel hungry, or because of the onset of heartburn. A few days ago, while I was doing my weekly grocery shopping, my back was achy, my hands were numb (and makes picking up things and pushing the trolley difficult, and also holding my phone which has my shopping list) and then suddenly I get heartburn. I realised I soon might need hubby to accompany me to shop (even though I know he dislikes shopping). I admit, I felt some frustration then. Towards the end when I cooked dinner that night, I asked hubby to take over because my hands were hurting. I sat down and could feel my feet were tired. For a few seconds, self-pity filled my mind. "How long more do I have to go through this?!" Very quickly though, I recalled I had a smooth first trimester. If I were very tired and throwing up all the time, I think I'd have felt a lot worse. I thank God for that, thank God for what I am going through now. I don't blame baby for the cause of these, especially when he is an answered prayer. I don't blame God or anyone. It helps to be thankful and learning what is "to be thankful in all circumstances". This is probably training me for the harder part - caring for the baby after he is born. Let's not think about that for now ;) I am also thankful for every movement I feel from the baby (even if they make me uncomfortable). Very honestly, I think I am still somewhat worried what if this boy isn't healthy or normal. For that, I have to just constantly present my worries and fears to my Lord and just trust Him. After all, this baby boy is really, God's child and I am only a steward to bear and care for him. Celebrated my birthday quietly and leisurely with hubby yesterday. We watched 3 movies over about a 24 hour time frame - at the cinema watching my favourite martial arts guy Donnie Yen, a true life story movie at Gold Class (gift for us from sister-in-law and family) and a Singaporean army movie at home. We also had lunch at my favourite seafood place and free ramen dinner which is one of my favourite too. It is nice to have a weekend of chilling out which would be a great luxury after baby comes.